So in the end what did we actually do with our one day in Paris? 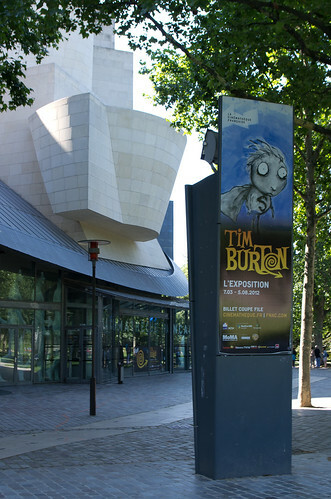 After getting off the train, we headed straight to La Cinémathèque française for their Tim Burton exhibit. It was a beautiful sunny day and we arrived pretty much as the museum opened. Ta da! 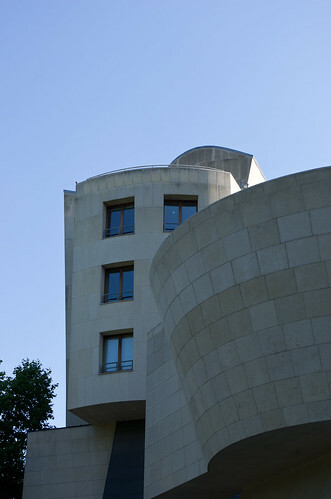 I was really impressed with the architecture of the building over all, some very cool lines. Unfortunately, it didn't seem to correspond at all to the inside layout. Still neat to look at though. Despite this, we still had to stand in what was a remarkably long line for 10:30am on a Saturday. Turns out that we could have bought tickets in advance which would have let us skip said line, but live and learn I suppose. Me playing around while waiting in line. In the end, we didn't get into the exhibit until nearly 11, and I was really surprised by how packed it was - not only with people, but with stuff. The local curators had done their best to try and lay everything out in a coherent manner, but the extremely small nature of the museum itself (surprising considering the expansiveness of the outside architecture) meant that all it did was exacerbate the problem of people just milling around rather than moving through the exhibit at a reasonable pace. Still, we enjoyed it and got a bit of a better insight into what is really a phenomenally twisted mind. Interesting stuff, but highly highly weird. It seemed to go down very well with the locals though. The rest of the museum was part history, part technological explanations, part costume display and again, surprisingly small. But it was enjoyable to wander around. Not sure if I would come back again just for the museum itself, but if they were showing a unique film that I was super keen to see or something else brought us to this corner of Paris and we had an hour or so to kill, I might. From there we were pretty hungry and tired of standing and decided to take lunch nearby to our next planned event. So back to the Right Bank we went and over to a charming little neighbourhood bistro called La Table de Claire. We had the lunch formule (simple fare, but extremely thoughtfully cooked, clearly the best of the day's market) with a glass of wine each and thoroughly enjoyed ourselves. 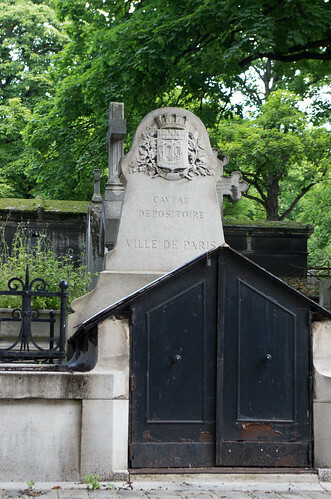 And also lost a little track of time, because we had to leg it over to the metro station to meet up with the Paris Walks guide for the tour of Père Lachaise Cemetery. 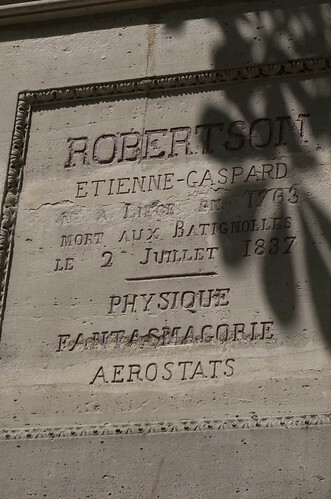 As always with Paris Walks, the guide was extremely knowlegeable and not only took us by the usual popular gravesites, but also showed us some of the more obscure-to-English speakers sites. It was funny because we kept running across a French tour with a very animated guide who was clearly perturbed that we English speakers were deviating from the "usual" path. Our guide also did a great job of explaining the history of not only the people, of the cemetary itself and how it fits into Parisian life. I've included a few samples of some of the things we saw, but the full set of pictures as usual is over on my flickr page. 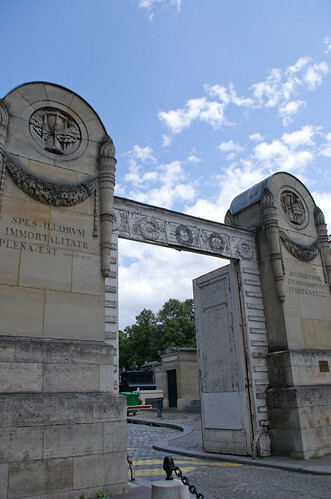 The entrance to the ossuary - where the bones of those whose graves have either had their leases expire and no family members come forward to claim the remains or those whose graves have fallen into disrepair. 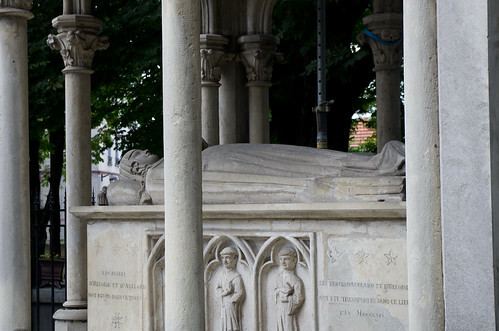 One of the oldest (though rebuilt several times) grave sites - that for Abelard & Héloïse. United in death as they never could be in life. 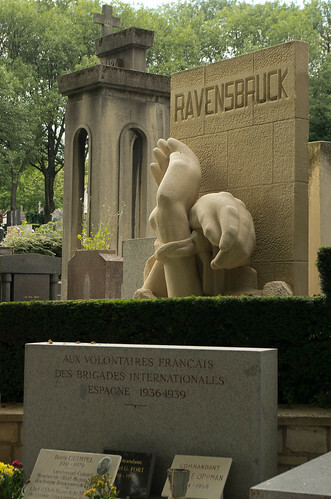 Loved this grave for the "fantasmagorie" or phantasmagoria in English. Fab! There were also some beautifully emotive sculptures - loved the way that this one caught the light through the trees. A neoclassical monument to someone forgettable, but I really enjoyed the combination of "eloquence" alongside "justice". Very French. 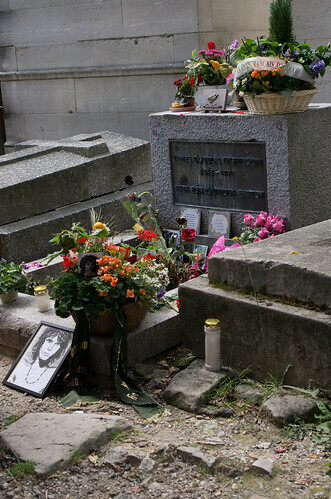 Obligatory picture of Jim Morrison's grave - apparently the fact that he was allowed to be buried here makes the French rather grumpy. 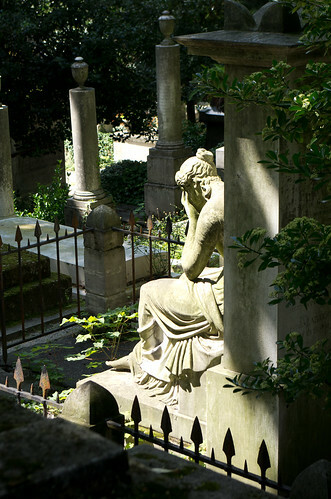 Lachaise is meant to be for residents of Paris only, and Morrison died while only visiting, you see. Judging from the tributes still left here (and the emotion of many young French school kids there), that seems to be a minority view. 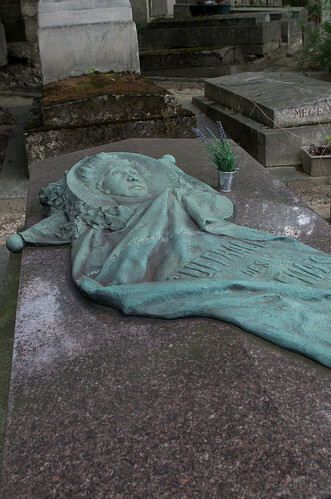 A monument redone for one of France's earliest suffragettes, Hubertine Auclert. 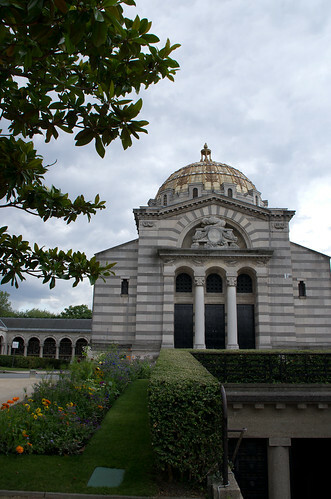 The crematorium - down below is where the ashes for Maria Callas were originally lain. 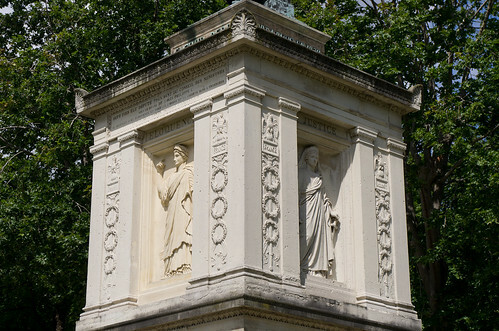 Another striking feature of the cemetery was the section dedicated to those who died in disasters or other acts of violence. There are several to the many WWII death camps - it's clear that the French national conscious still seems very troubled from their own complicity. As per usual, they've turned that discomfort into some beautiful and very moving tributes. And finally heading out of the cemetary is the monument to all the dead. Our guide explained that it's intended to express the many conflicted emotions that people often experience as they contemplate and face their own mortality. I thought it was beautiful and extremely moving. We sat here for a while to think and reflect. The tour was supposed to be 2 hours, but lasted nearly 3. Not complaining! But it did mean yet again that we were a little footsore and yet still had a few hours to kill before our train. We were also a little peckish (yet again) and so thought a bit of a nibble and some good french wine would do us good. Back into the centre of town we went, originally to Willi's, which unfortunately closed for refurbishment (a common practice during July in Paris), so we headed over to La Garde Robe as our second option - and was well worth being the first option. It was towards their closing time, so staffing was rather light (read: slow service), but we had time to kill so this wasn't an issue for us. We ordered a really delightful bottle of a light almost slightly fizzy red, served just a tiny bit chilled. It was *perfect* for a summer's day, and naturally I now can't find my notes as to what it was! Should have taken a picture of the label. We also had a lovely cheese & charcuterie plate along with a fantastic tomato salad. So we whiled away the last 2 hours or so over a bottle of wine and some very tasty food - just how a trip to Paris should end. Then it was back on the train home where we were sat across from another young (although younger than us) couple, who had just taken their first trip to Paris and gotten engaged. After a bit of oohing and aahing and congratulations-ing, we got to talking about Paris. What they liked, what they didn't and sharing our passion for the place. It was funny because the first thing they said was - the food was terrible. Then we asked them what they ate; they responded - pizza. Cue a look between Stephen and I, then I got out Clotilde's book and we talked about travel and food and our tips for finding good food in Paris and other cities. It was a lively and fun conversation, and I hope that we entertained them as well. It also brought back lots of memories about our early travel days and really brought into focus how much we've learned about each other and the world around us. A wonderfully thoughtful end to a pretty good day. Next up: Would we do it again? Thoughts & reflections on Paris as a day trip. 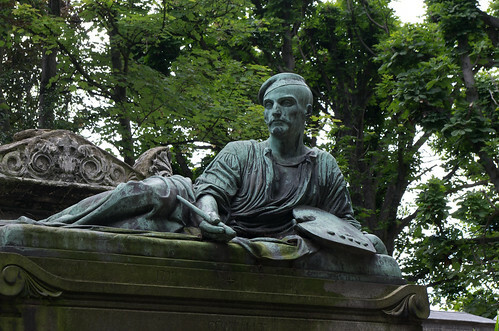 Haven't been around Pere Lachaise for so many years. I'd forgotten some of the beauty within. And young or not, seems a bit rich to complain of poor food after eating PIZZA in Paris!!! It's a funny thing - the reason they ended up eating pizza was because all the restaurants in the guide book they brought that they thought they could afford didn't have any spaces left (or wouldn't seat them because they spoke no French). Then wandering around they were so overwhelmed with everything and didn't know what to look for in a good restaurant with out a guidebook that they just ended up defaulting to something familiar, albeit terrible. They kind of knew that judging Paris by its pizza wasn't entirely fair, but they were completely at a loss as to what else they could have done. So we talked about Parisian dining culture, some resources they could use for next time (both in print and online), and a good French-English dictionary they could download to their iPhones. I could kind of empathise with this, because we had a similar problem when we first moved to London -and a similar horrible experience with pizza! We didn't know anyone, all we had were guidebooks, and there was so much choice (much of it in the tourist areas, was bad). It took us a while to get our bearings, figure out what the hallmarks of good restaurants were, find several websites that had reviews, meet people who had similar tastes to ours, etc. When all of that started happening, then we also started finding good food in London. :) No more pizza with sweet corn on it that was made 6 hours ago and reheated (kind of). One Day in Paris: Would we do it again?